After closing my 2 threads on Secret Space Program and Sphere Being Alliance (Blue Avian) Q&A's and Discussions I am opening this thread after speaking to Malc/The One and also request of quite a few members who have contacted me recently. There is quite a lot going on right now. As many know I have Surgery this Friday the 22nd. In addition to that I have attended a couple recent SSP Alliance and Sphere Being Alliance Joint Conferences. After some recent assasinations and attacks on some of the SSP Alliance Leadership and Bases that housed high value personnel by some of the "Defectors" from other programs there was quite a contentious meeting this past weekend. There was a follow up meeting that went smoother about 24 hours ago and I had another one on one meeting with Raw-Tear-Eir to discuss upcoming events and meetings I am being requested to attend again on their behalf at the Human Like ET Federation Conference Center/Station. I have spoken to DW as well in depth about the editing of the video interviews that we did quite some time ago. He has brought them to a professional team as he has admitted that it is too much for him to do on his own. There were some audio issues on his microphone and the editing had cost him several 40 hour weeks of work. I too was spoken to about not delivering certain information in a timely manner by the SSP Alliance and they want me to make sure that it gets out sooner even if I need to start working with multiple researchers. I have been very happy with the work Dr. Salla has done in his recent articles with our Q&A's through email. I just sent him another round of answers to questions this evening for another article that he should be publishing Wednesday or Thursday. The E-Book is mostly written but needs to be expanded on as it is just bullet points and facts. DW will be releasing his Part 2 Article as soon as he is done with this weeks taping of his Wisdom Teachings TV Show and then the "Contact In The Desert Conference" this coming weekend. There should be some very interesting disclosures there. Since the E-book is being released with just about the full amount of details he should be presenting some interesting information not heard so far. I look more forward to the E-Book (Released for Free) than I do the video interview because of the sheer amount of information that will be contained in it. Please do not ask questions (This is not a new Q and A Thread) here and try to keep the postings on topic and non-confrontational (It seems the drama has been reduced heavily recently and I hope it stays that way.). Lets please keep this a drama free thread and treat each other with respect. Remember the Blue Avian "Message"... Its not an easy path, But one I am attempting to follow even though I am a very fallable person that has quite a ways to go in my journey as well. I am focusing on forgiveness and becoming more loving as much as possible... The link in my signature below will bring you to more info about the "Message". I have no questions other then to say it's great to have you back on your own thread. Someone posted Dr. Salla's q and a's from his last article on youtube. Good luck and speedy recovery with your surgery. I'll send some light your way. Thank you from my heart for a new update and you want a quick and safe recovery of the upcoming surgery, Corey! With excitement we expect the upcoming news! Take care and stay safe! I believe this is one of two articles that Dr. Salla of Exopolitics.org is releasing today from the material we covered. I am so glad to see a new thread here by you on ToT, Corey. It was difficult to keep track of what was going on with the two former threads gone. I had not been aware of the 'negativity' that caused you to leave, probably because by the time i logged in each day most 'problems' had already been dealt with as i am at Canada's west coast and always logging in later in the day. as always my thanks for keeping us aware of all these so crucially important goings on. Since interview Corey is listed space travel, I explain a few things arising from the physics of the tunnel and some experiments on the nodes of the grid. Each point of space and time in any dimension resides has a vibratory cordinata. It stems from a phase conjugation at 180 �, that is the signature of a compressive energy spiral in a regime fractal, or the passing of a toroid. If an energy modulation of another coordinate (electromagnetism) (difference of rotation space between stars and planets) is printed on the spatial matrix spinning the previous course it opens a portal. Between the two energy points flowing energy, thanks to the phenomenon of resonance while the two points are a new equilibrium. By adjusting the amplitude of the vibration and the resonant spaces you can establish an energy flow in either direction between them. Two points out of phase are naturally interconnected with a spatial shift of 90 degrees as the pulse of a hypercube, then in the tunnel can be moved around, you just enter the current energy. Lianakea is only the network of a toroid that center implosive the great attractor. 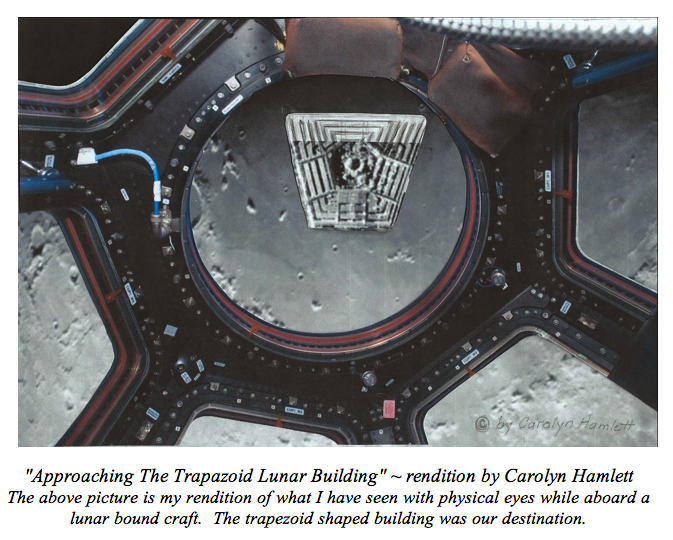 Corey - Per the Salla Q & A, here http://exopolitics.org/multiple-moon...over-programs/ regarding Q 20, which I pasted below, it is interesting that you say the base on the back side of the Moon is a trapezoid shape. Here is a rendition she created of what she saw. 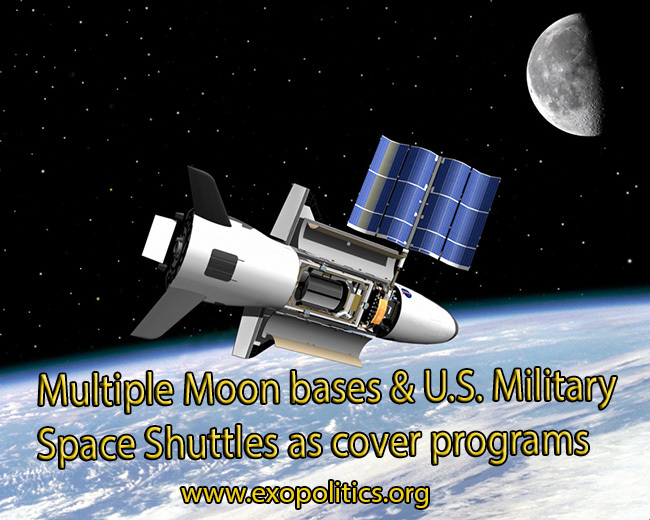 It is a Heavily Guarded and Secret Base that is at about the 10 O’clock Position, on the Back Side of the Moon. The portion that is visible it a “Trapezoid Shape”. It is only accessible to the Dark Fleet and some ICC Personnel as well as the Draco Allied Forces. Some amateur astronomers have caught video of swarms of craft leaving from this base location on a couple of locations. It is presumed to go far beneath the surface of the Moon just as the LOC does. Last edited by lift the veil, 21st May 2015 at 01:45. Corey - Per the Salla Q & A, here http://exopolitics.org/multiple-moon...over-programs/ which I pasted below, it is interesting that you say the base on the back side of the Moon is a trapezoid shape. Wow, I hope to find the exact quote of her description of this base. Did she give any details of being in that base or only that she saw it? There is almost ZERO information on the lay out and details of that base. It is some information that would be very useful. Corey - At the very bottom is an excerpt from that link I posted ( http://beyondthephysical.blogspot.co...&by-date=false ) of her blog entry. She talked about her experience in a Youtube interview here. She used to be involved in the "Ascended Master Spiritual Hierarchy" that were unbeknownst to her actually part of the dark side and she has since become a Christian to remove all of the negative demonic/entity attachments that were used in her mind control programming. That may be off-putting to some but it has worked for her (becoming a Christian) and it is referenced throughout the interview. My first thought when I saw this structure was of it’s unique and significant shape, that of a de-capped pyramid and how much in architecture it reminded me of the Pentagon as seen in aerial photographs. The rendition I have created is very much like the view I had as the craft I was in was making it’s approach. 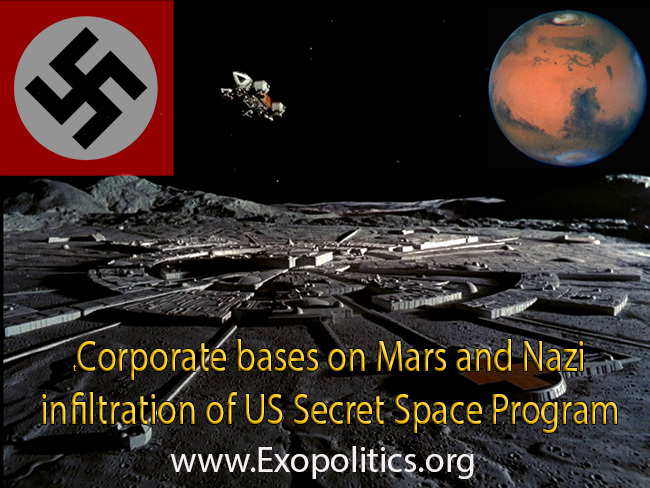 However, the actual building on the lunar surface does not have an inner court yard. Last edited by lift the veil, 21st May 2015 at 02:08.